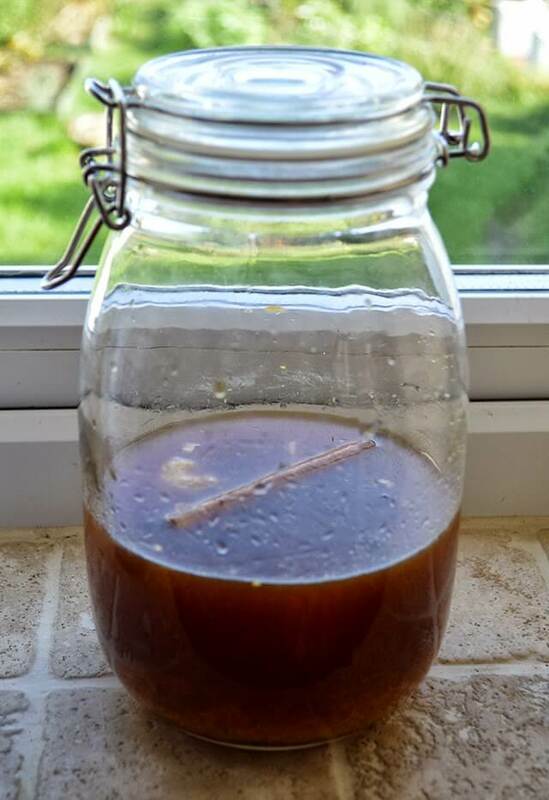 A few weeks ago a friend gave me a small jar of an amber coloured liquid she called ‘Shrub’. To me it looked a bit deadly and to be honest I was afraid to smell it let alone taste it. Imagine my surprise when just a few days later I screwed the top to discover the sweet aroma of rum sweetened with sugar, citrus, and spices. The unusual liqueur had the consistency of a light sugary syrup and tasted like something Victorian ladies might have sipped as a Digestif. I was hooked. As it turns out, Shrub is an entire category of rum-based liqueur with quite an illustrious history. In the days of bootlegging and smuggling, barrels of rum used to be sunk in harbours off the south coast of England only to be pulled back up when ‘the coast was clear’. Unfortunately the liquor’s sojourn in the sea left it with a brackish flavour due to small amounts of salt water seeping in through the barrels’ seams. Instead of throwing the whole lot out, some forgotten genius figured out how the saltiness could be disguised with sugar and spices to make it palatable, and more importantly sale-able. Since then Shrub has become famous as the drink made by Phillips of Bristol and is a traditional tipple in places like Cornwall, where it’s served with even more rum. It has also been discovered by rather trendy bars in both the UK and across the pond where its intense sweet flavour is being used to compliment mixed drinks and cocktails. Though Phillips’ Shrub is relatively inexpensive, I’ve not been able to find it for sale anywhere on the Isle of Man. There’s always the option to buy it online and have it shipped over but I thought it might be more fun to try making it myself. 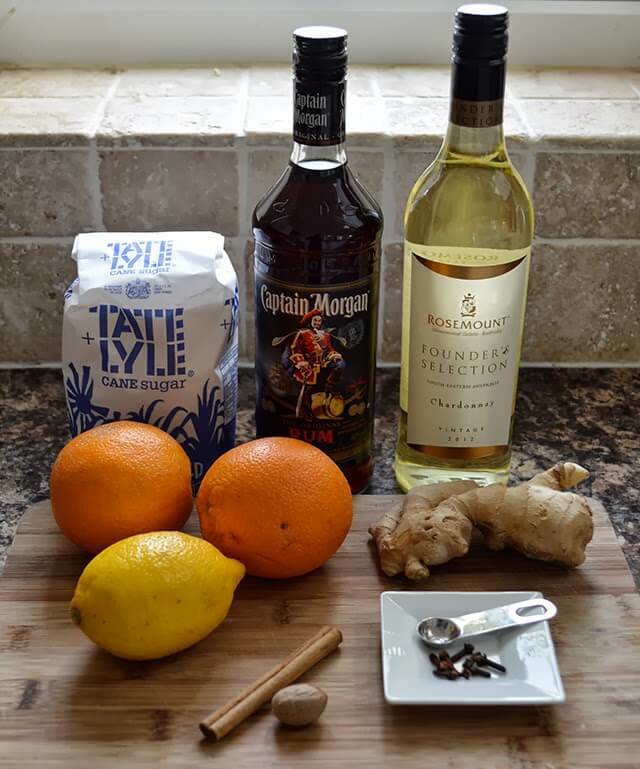 Though I can’t be absolutely certain of which herbs and spices are used in the genuine product, I had a look at traditional Shrub recipes, took an educated guess and came up with a drink that is both similar and delicious. Sweet but not sickly sweet, the fruity flavour of oranges and lemons and rich Autumnal spices comes through beautifully. My version is also a little bit boozier than the original so it’s possible to have it neat without being overwhelmed by sweetness. Step 1. Take all the ingredients listed in ‘Day One’ and place them into a glass jar. Store the jar in a dark place for a full week taking it out once a day to give it a gentle shake. Juice note: The juice quantities are what I got from squeezing the one large orange and lemon after I zested them. As fruits differ in size and juice quantities please make sure to measure your own juice for consistency’s sake. 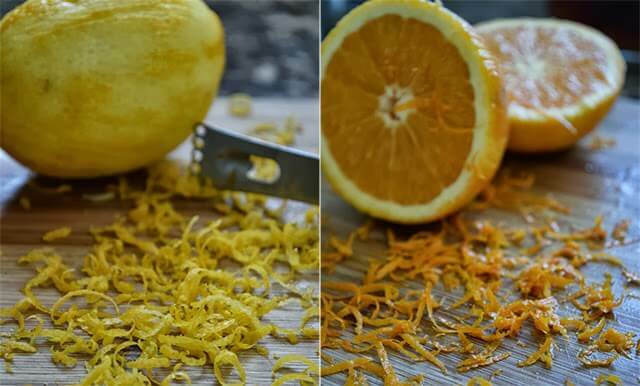 Zest note: If you’re not sure what zest is I’ve posted a photo above to show it as the finely grated skin of citrus fruits that excludes the bitter white pith. I have a zesting tool that I use all the time (pictured above next to the lemon) but it’s also possible to use a cheese grater to get the job done. Spices note: It’s important to use whole spices rather than their powdered versions because you want your liqueur to end up as clear as possible. It’s more difficult to filter out powdered spices than whole ones but if you only have powders and don’t mind some haziness then go ahead and use them. Step 2. 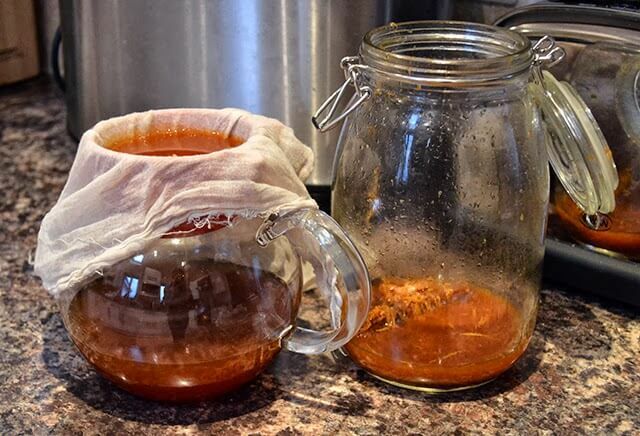 Strain the liquid through a muslin or jelly-bag at least twice if not three times. Your aim is to remove as much of the ‘bits’ as possible. 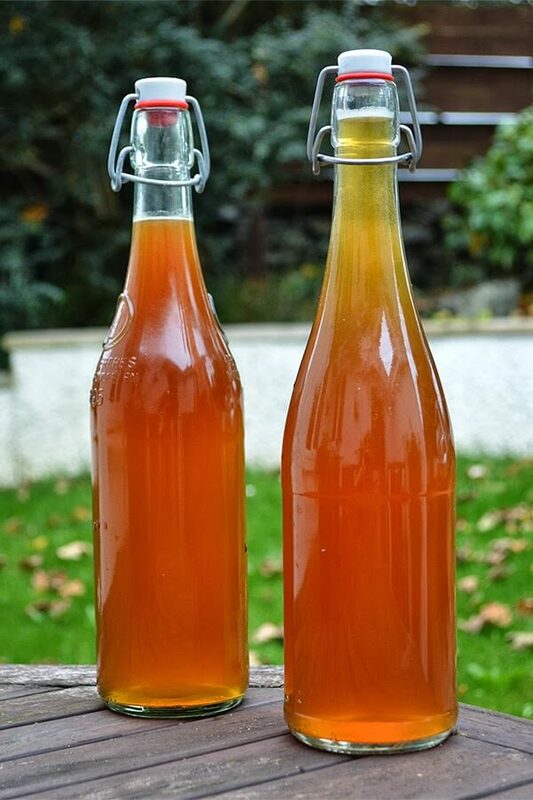 Leave your final filtered liquid in a jar to settle for at least a few hours and preferably overnight. If you have a jar that has a spout, like the tea infuser I use, it will make the final step easier. Step 3. Place the entire bottle of white wine into a sauce pan and heat on low until the wine is just warm. Do not bring it to a simmer or you’ll lose alcohol to heat and evaporation. When warm, take the wine off the hob and then stir in the honey and the sugar until it’s completely dissolved. Allow the wine to cool to room temperature. Wine Note: I’ve used an inexpensive Chardonnay in this recipe but probably any light flavoured white wine will do. Step 4. Gently pour the infused rum into the sugared wine leaving as much of the sediment in the container as possible. 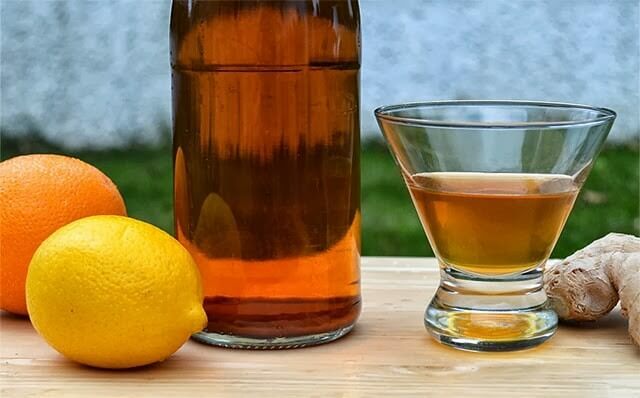 Though not harmful, this residue of fruit and spices will be unsightly and can cloud your liqueur. Step 5. Pour your Shrub into clean, sterilised bottles, store them in a dark place, and allow them to mature for a week before serving. This week helps to clear the alcohol but also adds mellows out the flavour but if you can’t wait that long go ahead and have a sneaky sample. Due to the fresh juice used in this recipe, try to use your final alcohol within four to six weeks. Refrigeration will also help to prolong the shelf-life. This is definitely one of the more interesting recipes I've seen out there. I bet it's delicious! Looks like a fabulous sipper. Excellent recipe. i am a connoiseur of all kinds of drinks, so would absolutely try it at home. Thanks Kulwant…hope you enjoy it! I have one thing to say: nom nom nom. Okay, that's three things. Guess what I'm buying next trip into town… Thank you! Welcome 🙂 And have fun making it! This recipe looks and sounds amazing. I just finished all the steps in 'Day One' and am looking forward to the end product. And I'm also wondering how you drink it (as a mixer, on the rocks…). It's strong enough to have on the rocks but you can mix it with rum to have a stronger drink. Let me know how yours turns out? Oh, I so have to make this tomorrow. Mmm, I've loved rum since a holiday in the caribbean introduced me to Appleton's! I don't drink very often but this sounds delicious – the perfect tipple for autumn evenings! I highly recommend it for cold and drizzly evenings…it will warm you right up! There would have been a place for you in rum runner days! It sounds really good. Oh yes! I'd be the best bootlegging wench in Britain! Arrrr! 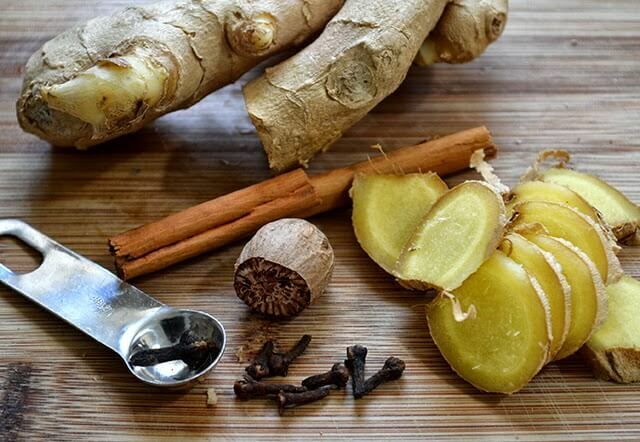 I'm thinking this might be just the thing for winter colds and flu! A non-alcoholic one would be nice too – I don't drink, but the ginger and spices sound lovely together with citrus juice. This sounds delicious Tamya but as both the farmer and I are on medication which forbids alcohol in any form at the moment, it is also frustrating! This looks delicious, but how do you drink it: on the rocks? room temperature? with a mixer? You can have it on the rocks, mixed with rum, or even use it to create mixed drinks. It's up to you!